1. 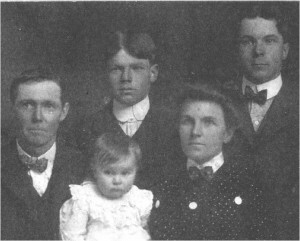 William PICKERING (possibly the brother of Richard PICKERING) married Unknown UNKNOWN. 1.1. Joseph PICKERING baptised 13 June 1725 Auckland St. Andrew, Co. Durham, married 17 December 1745 Auckland St. Andrew, Co. Durham Hannah JOHNSON. 1.1.1. Elizabeth PICKERING baptised 7 July 1747 Auckland St. Andrew, Co. Durham. 1.1.2. William PICKERING baptised 2 June 1750 Auckland St. Andrew, Co. Durham, buried 24 September 1758 Auckland St. Andrew, Co. Durham. 1.1.3. John PICKERING baptised January 1753 Auckland St. Andrew, Co. Durham. 1.1.4. Francis PICKERING baptised 10 August 1755 Auckland St. Andrew, Co. Durham. 1.1.5. Mary PICKERING baptised 17 July 1757 Auckland St. Andrew, Co. Durham. 1.1.6. Anne PICKERING baptised 19 February 1763 Auckland St. Andrew, Co. Durham, buried 31 January 1765 Auckland St. Andrew, Co. Durham. 1.1.7. Charles PICKERING baptised 29 September 1765 Auckland St. Andrew, Co. Durham. 1.1.8. Joseph PICKERING farmer baptised 17 July 1768 Auckland St. Andrew, Co. Durham, died 1847 Sculcoates, Hull, married 1 June 1789 Haughton le Skerne, Co. Durham Jane WRIGHT born c1764. 1.1.8.1. Joseph PICKERING agricultural labourer, born c1790 Co. Durham, died 1855 Leconfield, married 27 December 1813 Hessle Jane STICKNEY-MANSFIELD born 25 January 1792 Woodmansey. 1.1.8.2. Thomas PICKERING tanner, baptised 27 December 1795 Sutton, died before 1851, married 16 August, 1829 Beverley Ann LASCELLS born c1810 Weel. 1.1.8.3. Jane PICKERING baptised 16 June 1798 Sutton, Hull. 1.1.8.4. Hannah PICKERING baptised 27 April 1802 Sutton, Hull, had a child by Unknown UNKNOWN, married 11 August 1822 Cottingham William BUTLER. 1.1.8.5. John PICKERING born 1809. 1.1.8.1.1. Robert PICKERING baptised 27 September 1814 Hessle. 1.1.8.1.2. John Mansfield PICKERING baptised 6 April 1817 Hessle. 1.1.8.1.3. Joseph PICKERING born 4 April 1819 Leconfield, baptised 31 May, Hessle. 1.1.8.1.4. Hannah PICKERING baptised 19 August 1821 Cottingham, had children by Unknown UNKNOWN. 1.1.8.1.5. Robert Wardle PICKERING farmer, born 24 January 1824 Cottingham, baptised 6 June Hessle, died 27 June 1903 Haskins, Wood County, Ohio, U.S.A., married Polly A. Mary STEPHENS born 10 July 1832, New York, U.S.A., died 27 April 1905 Wood County, Ohio, U.S.A.
1.1.8.1.6. George PICKERING baptised 17 September 1826 Hessle. 1.1.8.1.7. Mary PICKERING baptised 5 May 1831 Leconfield. 1.1.8.1.8. Thomas PICKERING baptised 22 December 1833 Leconfield, died 1834 Leconfield. 1.1.8.1.9. Mary Ann PICKERING born 1838 Leconfield, married c1860 Charles EARLY labourer, born c1836. 1.1.8.2.1. Elizabeth PICKERING baptised 9 October 1831 Sculcoates, Hull. 1.1.8.2.2. Jane PICKERING baptised 15 September 1833 Sculcoates, Hull. 1.1.8.2.3. Henry PICKERING baptised 8 November 1835 Sculcoates, Hull. 1.1.8.2.4. Mary PICKERING baptised 9 July 1837 Sculcoates, Hull. 1.1.8.2.5. Sarah PICKERING baptized 15 December 1839 Sculcoates, Hull, married John HAINES millstone maker, born c1836 Brighton, Sussex. 1.1.8.2.6. Samuel PICKERING born c1840. 1.1.8.2.7. George PICKERING labourer, baptised 1 August 1841 Sculcoates, Hull, married 22 April 1869 Hull Emma BROWN. 1.1.8.2.8. Michael PICKERING labourer, born 1844 Sculcoates, Hull, married 1871 Sculcoates Christiana WILES born 1847 Hull. 1.1.8.2.9. John PICKERING labourer, baptised 14 May 1848 Hull, married 1866 Sculcoates, Hull Margaret McMULLON born c1848 Hull. 1.1.8.4.1. Thomas PICKERING farmer, publican, baptised 28 April 1822 Cottingham, died 1892 Sculcoates, Hull, married 1843 Sculcoates, Hull Mary WILES (daughter of Thomas WILES) baptised 31 August 1823 Marfleet, Hull. 1.1.8.1.4.1. William PICKERING bricklayer born c1849 Leconfield, married 1871 Beverley Mary Ann TURNBULL. 1.1.8.1.4.2. Edward PICKERING baptised 28 January 1851 Beverley, buried 28 October 1852 Leconfield. 1.1.8.1.5.1. Mary Belle PICKERING born 5 September 1865 Haskins, Wood County, Ohio, U.S.A., died 9 January Wood County, Ohio, U.S.A, married 16 March 1887 Bowling Green, Wood County, Ohio, U.S.A. Andrew J. KNAUSS born 27 January Plain Township, Wood County, Ohio, U.S.A., died 24 November Wood County, Ohio, U.S.A.
1.1.8.1.5.2. Estelle May PICKERING born 1867 Wood County, Ohio, U.S.A.
1.1.8.1.5.3. Robert Lewis PICKERING born 25 March Haskins, Wood County, Ohio, U.S.A., died 1 December 1935 Wood County, Ohio, U.S.A., married 16 July 1886 Bedford, Monroe County, Michigan, U.S.A. Leah ESTER WHITMILL born 22 September 1869 Dunbridge, Wood County, Ohio, U.S.A., died 18 August 1942 Wood County, Ohio, U.S.A.
1.1.8.1.5.4. Myrtle Alwood PICKERING born 30 March 1876 Middleton, Wood County, Ohio, U.S.A., died 14 December 1931 Wood County, Ohio, U.S.A., married 26 November Wood County, Ohio, U.S.A. Perry Graham PULTZ born 15 April 1872 Fort Seneca, Ohio, U.S.A., died 19 December 1919 Bowling Green, Wood County, Ohio, U.S.A.
1.1.8.2.8.1. Annie B. PICKERING domestic servant, born c1873 Sculcoates, Hull. 1.1.8.2.8.2. Lillie PICKERING born c1880 Hull. 1.1.8.2.9.1. John Henry PICKERING born 1874 Hull. 1.1.8.2.9.2. Edith Anne PICKERING born 1877 Hull. 1.1.8.4.1.1. Mary Jane PICKERING born 1846 Cottingham, married 1866 Hull Charles CUTSFORTH. 1.1.8.4.1.2. Selina PICKERING servant, born 1846 Cottingham. 1.1.8.4.1.3. 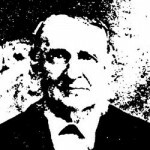 Thomas PICKERING cab driver, born 1848 Cottingham, died 1889, married 1870 Sculcoates, Hull Jane Ann BROWN born c1850 Hull. 1.1.8.4.1.4. 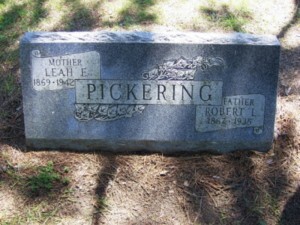 Edith Ann PICKERING born 1850 Cottingham. 1.1.8.4.1.5. Alfred PICKERING commission agent, born 1851 Cottingham, died 1909 Hull, married 1875 Sculcoates, Hull Ann HAGUES (daughter of William HAGUES and Elizabeth UNKNOWN) born c1852 Stepney, Hull. 1.1.8.4.1.6. Arthur William PICKERING labourer, born 1853 Cottingham. 1.1.8.4.1.7. George PICKERING born 1856 Cottingham, married 1880 Sculcoates, Hull Eliza BROWN. 1.1.8.4.1.8. John PICKERING butcher, born 1857 Cottingham, married 1878 Pocklington Elizabeth CLARK born c1860 Garton. 1.1.8.4.1.9. Charles PICKERING market gardener, born 1859 Hull, married 1880 Sculcoates Priscilla PEARSON born c1861 Cottingham. 1.1.8.4.1.10. Phoebe PICKERING born 1862 Cottingham, married 1887 Hull Friedrich Emil POULSEN. 1.1.8.4.1.11. 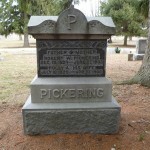 Adam PICKERING labourer, born 1866 Cottingham, died 1921, married 1887 Beverley Margaret WARD. 1.1.8.1.5.3.1. George William PICKERING born 25 February 1887 Dunbridge, Wood County, Ohio, U.S.A., died 3 December 1950 Bowling Green, Wood County, Ohio, U.S.A., married 14 October Bowling Green, Wood County, Ohio, U.S.A. Alta May TAYLOR born 1 October 1889 Moline, Wood County, Ohio, U.S.A., died 31 May Weston, Wood County, Ohio, U.S.A.
1.1.8.1.5.3.2. Harry Lewis PICKERING born 31 May 1889 Dunbridge, Wood County, Ohio, U.S.A., died 24 July 1856 Wood County, Ohio, U.S.A., married 1st Edith M. BINGER born August 1893 Warwick, Tuscarawas County, Ohio, U.S.A., married 2nd Sarah Alice BOPERY, had a child by Helen Opal MERRILL. 1.1.8.1.5.3.3. Bessie PICKERING born 23 November 1893 Dunbridge, Wood County, Ohio, U.S.A., died 16 August 1901 Wood County, Ohio, U.S.A.
1.1.8.1.5.3.4. James E. PICKERING born 7 November 1897 Dunbridge, Wood County, Ohio, U.S.A., died 20 December 1898 Ohio, U.S.A.
1.1.8.1.5.3.5. 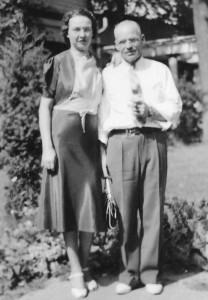 Gerald Weldon PICKERING born 9 January 1904 Dunbridge, Wood County, Ohio, U.S.A., died 19 April 1975 Maumee, Lucas County, Ohio, U.S.A., married 1st Helen Opal MERRILL born 3 November 1908 Ohio, U.S.A., died 24 February 1989 St. Petersburg, Pinellas County, Florida, U.S.A., married 2nd Mae Clarissa MAPES born 5 February 1910 North Baltimore, Wood County, Ohio, U.S.A., died 15 November 2000 Monclova, Lucas County, Ohio, U.S.A.
1.1.8.4.1.3.1. Thomas Raisbeck PICKERING born 1871 Hull. 1.1.8.4.1.5.1. Annie Gertrude PICKERING born 1876 Sculcoates, Hull, died 1881 Sculcoates, Hull. 1.1.8.4.1.5.2. Charles Ernest PICKERING born 1878 Sculcoates, Hull, died 1879 Sculcoates, Hull. 1.1.8.4.1.5.3. William Hagues PICKERING born 1879 Sculcoates, Hull, died 1880 Sculcoates, Hull. 1.1.8.4.1.5.4. Charles PICKERING born 1880 Sculcoates, Hull, died 1880 Sculcoates, Hull. 1.1.8.4.1.5.5. Harold PICKERING born c1881 Sculcoates, Hull, married 1913 Sculcoates, Hull Lily MAIR born 1887 Patrington. 1.1.8.4.1.5.6. Alfred PICKERING born 1883 Sculcoates, Hull, died 1884 Sculcoates, Hull. 1.1.8.4.1.5.7. Bertha Jane PICKERING born 1884 Sculcoates, Hull, married 1912 Sculcoates, Hull John H.N. 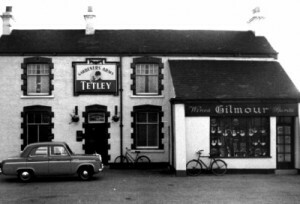 WILLIAMSON. 1.1.8.4.1.5.8. Edith PICKERING born c1888 Sculcoates, Hull, married 1914 Sculcoates, Hull Ernest Barrow EDMONDSON born 1887 Hull. 1.1.8.4.1.5.9. Charles Frederick PICKERING born 1892 Sculcoates, Hull, died 1959 Hull, married 1922 Sculcoates, Hull Annie PICKARD. 1.1.8.4.1.8.1. Ernest PICKERING born c1878 Fimber. 1.1.8.4.1.8.2. Mary J. PICKERING born c1883 Fimber. 1.1.8.4.1.8.3. Lucy PICKERING born 1885 Cottingham. 1.1.8.4.1.9.1. Gertrude PICKERING born c1883 Hull. 1.1.8.4.1.9.2. Herbert PICKERING market gardener, born c1885 Hull. 1.1.8.4.1.9.3. Margaret PICKERING born c1891 Hull. 1.1.8.4.1.9.4. 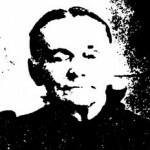 Edith Mary PICKERING dressmaker, born c1893 Hull. 1.1.8.1.5.3.1.1. Arnold Robert PICKERING born 14 June 1911 Toledo, Lucas County, Ohio, U.S.A., died December 1971 Toledo, Lucas County, Ohio, U.S.A., married 1939 Josephine HALL born 1913, died 1992 Wood County, Ohio, U.S.A.
1.1.8.1.5.3.1.2. Pearl Doretta PICKERING born 6 February 1915 Dunbridge,Wood County, Ohio, U.S.A., died 23 October Bowling Green, Wood County, Ohio, U.S.A., married 1st 22 June 1935 Maumee, Lucas County, Ohio, U.S.A. Graydon Emerson SHEPERD born 24 February 1915 Maumee, Lucas County, Ohio, U.S.A., died 3 July 1984 Wauseon, Fulton County, Ohio, U.S.A., married 2nd Lawrence I. BROWNE. 1.1.8.1.5.3.1.3. Ruth Naomi PICKERING born 24 December 1920 Maumee, Lucas County, Ohio, U.S.A., died 15 September 1998, married 1st 27 November 1947 William Myron LUSK born 18 August Ohio, U.S.A., died 23 November 1977, married 2nd Wilbur Maurice DELLINGER born 5 May 1906 Williams County, Ohio, U.S.A., died 27 July 2000 Williams County, Ohio, U.S.A.
1.1.8.1.5.3.1.4. Iva Mae PICKERING born 24 December 1920 Maumee, Lucas County, Ohio, U.S.A., died 21 January 1974 Harlington, Cameron County, Texas, U.S.A., married 26 June 1946 Toledo, Lucas County, Ohio, U.S.A. Lester SWORDEN born 23 August 1919 Toledo, Lucas County, Ohio, U.S.A., died 18 November 1992 Grand Rapids, Wood County, Ohio, U.S.A.
1.1.8.1.5.3.1.5. Claire Belle PICKERING born 2 February 1924 Maumee, Lucas County, Ohio, U.S.A. died 21 Janaury 1947 Harlington, Cameron County, Texas, U.S.A., married 14 September 1943 Wilbur J. POST born 30 September 1920 Michigan, U.S.A., died 27 December 2006. 1.1.8.1.5.3.1.6. 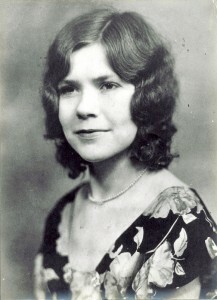 Lula June PICKERING born 11 March 1926 Maumee, Lucas County, Ohio, U.S.A.
1.1.8.1.5.3.1.7. 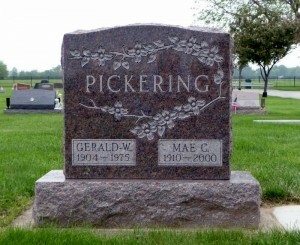 Donald George PICKERING born 23 July 1931 Maumee, Lucas County, Ohio, U.S.A.
1.1.8.1.5.3.1.8. Robert Allen PICKERING born 16 October 1931 Maumee, Lucas County, Ohio, U.S.A.
1.1.8.1.5.3.2.1. Leona M. PICKERING born 15 October 1911, Ohio, U.S.A., died Toledo, Lucas County, Ohio, U.S.A.
1.1.8.1.5.3.2.2. Ethyl PICKERING born 18 November Middleton, Wood County, Ohio, U.S.A, died 8 September 1995 Toledo, Lucas County, Ohio, U.S.A.
1.1.8.1.5.3.2.3. Doris Elene PICKERING born 26 June Lucas County, Ohio, U.S.A., died 27 November Kenton, Auglaize County, Ohio, U.S.A.
1.1.8.1.5.3.2.4. Inis Polla PICKERING born 1 April 1920 Ohio, U.S.A., died 22 August 1955 Lucas County, Ohio, U.S.A.
1.1.8.1.5.3.2.5. Harry PICKERING born 10 May 1922 Lucas County, Ohio, U.S.A., died 27 November 1944. 1.1.8.1.5.3.2.6. Claude B. PICKERING born 31 July 1926, died 21 April 2003 Adrian, Michigan, U.S.A.
1.1.8.1.5.3.2.7. Geraldine Mae PICKERING born 28 June 1928 Monclova, Lucas County, Ohio, U.S.A., died 25 January 2000 Toledo, Lucas County, Ohio, U.S.A.
1.1.8.1.5.3.2.8. Helen PICKERING born 1930. 1.1.8.1.5.3.5.1. Duane E. PICKERING born 6 June 1926 Dunbridge, Wood County, Ohio, U.S.A., died 22 August 1955 Wood County, Ohio, U.S.A.
1.1.8.1.5.3.5.2. Lenela Lillian PICKERING born 20 September 1927, died 1 May 2014 Perrysburg, Wood County, Ohio, U.S.A.
1.1.8.1.5.3.5.3. Robert PICKERING born 4 December 1928 Ohio, U.S.A., died 10 December Winslow, Arkansas, U.S.A.
1.1.8.4.1.5.5.1. Irene PICKERING born 1914 Hull. 1.1.8.4.1.5.5.2. 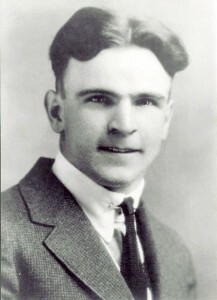 Charles W. PICKERING born 1917 Hull. 1.1.8.4.1.5.9.1. Betty PICKERING born 1925 Hull. 1.1.8.4.1.5.9.2. Joan PICKERING born 1927 Sculcoates, Hull. 1.1.8.4.1.5.9.3. Joyce PICKERING born 1929 Sculcoates, Hull.